Inspired by a question on Twitter, I take a look at how to avoid using subjects in Japanese. (Hint: Just ignore them mostly.) Besides just leaving them out, there are a ton of phrases in the language that promote concision, notably a few handy 文末 phrases. I address そうだ and ようだ in the piece, but らしい and みたい are also very effective in similar roles. They all have subtly different usages, so it can be helpful to look at Japanese definitions. These are all from the wonderful 日本語文型辞典. Do your best to ignore my awful translation. Expresses a speaker’s impression or estimation-like judgment about something. Presents the impression or external appearance (of something) according to the external appearance (of the thing) or the speaker’s senses and suggests “It kind of seems that way/It looks that way.” Used when a speaker gives an impression or condition (of something) taken from the speaker’s sense of touch, sight, hearing, smell, etc. and when making other observations like that to give the speaker’s general, estimation-like judgment. Appended to the end of sentences to express that the speaker believes the content has a very high level of certainty. The basis for that judgment is objective, such as outside information or something that is observable, not simply imagination. Added on to 普通体 (direct style) clauses to express that (the clause) is not something you received directly but reported information that came from somewhere else. Does not form negative or past tense constructions. Expresses a speaker’s estimation. Means “I can’t tell for certain, but that’s what I believe.” An expression used to give an estimation based on something the speaker directly experienced, such as they saw something, heard something, or smelled something. Conversely, 「らしい」 is used when expressing the speaker’s estimation based on indirect information, such as something heard from another person. 「そうだ」 is used when reporting something exactly as it was heard. I’ve been wanting to post something like this for a while. I actually drafted it way back in 2009 (typed out the sections from the 文型辞典) but lost the post to a hard-drive crash and have been too lazy to get it together since. I think it’s helpful to look at things like this explained in Japanese. The book also has a ton of great example sentences. 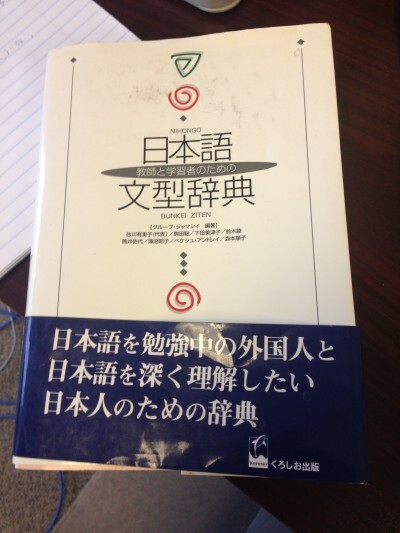 Definitely a must-own for any students of Japanese who make it beyond the intermediate level. Still, it’s one thing to know the dictionary definition of these patterns and another thing entirely to put them into practice. The occasional reminder from texts like the 文型辞典 can help us be mindful of the usages. Now get out there and get reporting indirectly and judging subjectively! This entry was posted in appear, reporting and tagged grammar, subject by Daniel. Bookmark the permalink.